OAKLAND, Calif. — Mark Jackson sarcastically snickered when he said it. "I thought the best close-out of the night was the last shot," added the third-year Golden State coach. After storming back from 18 points down in the second half during Thursday night’s Game 3 vs. the Clippers, the Warriors got the ball in the hands of Stephen Curry with a chance to win it during the game’s final seconds. But the tough defense of banged-up Clippers guard Chris Paul prevented Curry from playing hero in a hard-fought 98-96 Clippers victory. Curry sure thought he got hit, so did the Oracle Arena crowd. "Steph was looking to turn the corner, Chris did a good job of putting hands on him, and when he went up for the shot … you’re supposed to be able to come down," Jackson said. When asked again if he thought it was a foul on Curry, after a pause, Jackson said, "Well, he’s supposed to be able to land and clearly, he wasn’t able too. "I’m not looking for an apology tomorrow." 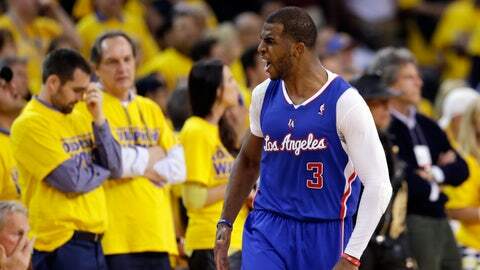 Clippers head coach Doc Rivers saw the play differently. For a team well known for its outside gunners, the Warriors managed to only hit 6-of-31 shots from behind the arc. "(It was a) bad shooting night, I got some great, wide-open looks," said Klay Thompson, who had a team-high 26 points for the Warriors. "Six for 31 is uncharacteristic for us." "We let their guys get loose and that bothered me," Rivers said. "Every time I see one (3-pointer) go up in the air, that’s a dagger for me, because that’s the line I want to defend. A lot of them were broken plays." The 17 turnovers also didn’t help the Warriors’ cause. "We turned the basketball over too much … just got out of character," Jackson said. 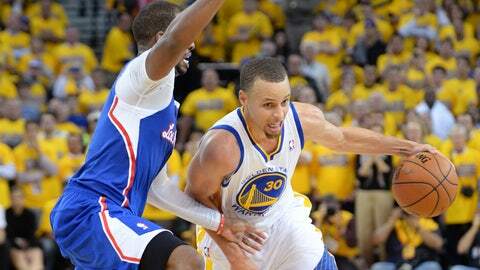 The Clippers hold a 2-1 series lead when action resumes on Sunday at 12:30 p.m.